Periodically, the ToolBank convenes partners for a powerful community networking event: 2 Degrees of ToolBank. The idea to host regular networking events springs organically out of informal referrals from one partner to another that happen at the ToolBank weekly. 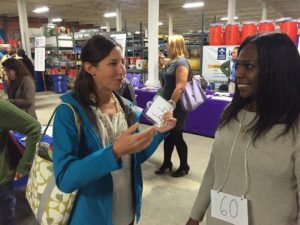 Partners mingle at a recent 2 Degrees of ToolBank event. ToolBank staff get the opportunity to hear about a range of positive community-based projects happening throughout our shared community. Every week, dozens of partners filter through our doors to equip themselves for their most ambitious community projects. As we connect with different partners, we see the need to make sure they connect with each other. After all, resources are limited and best when shared across the board throughout the community sector. 2 Degrees of ToolBank provides an avenue for that sharing and dialogue with community colleagues. Once or twice a year, we host this event for partners, asking them to identify 1 – 3 of the most pressing needs they face in their community work. Each partner is given floor time to speak their needs, then a chance to communicate with others in the room who may have a solution or resource to assist in meeting those needs. The concept is simple, the outcomes powerful: gather community leaders in one place at one time, facilitate dialogue, then watch as connections are made and partnerships forged. At the ToolBank, we understand that the best way forward in strengthening and celebrating our community is in step with partners. Our entire model is partner-based; 2 Degrees of ToolBank provides a chance to deepen and enrich our offerings to those we serve. These events do not happen at one standard time every year. Rather, they are spaced out based on partner demand. If you are a partner and want to know when the next event will take place, inquire with ToolBank staff the next time you visit or call direct at (410) 244-5565.